Onion is the common name for the herbaceous, cold season plant Allium cepa, which is characterized by a edible, rounded bulb composed of concentric, fleshy, tightly packed, and enlarged leaf bases. Onion is also the name of this edible bulb, which is commercially valuable and known for its pungent oil that departs a strong taste. Closely related plants of the same genus include chives (Allium schoenoprasum), garlic (A. sativum and A. scordoprasum), and leeks (A. porrum). There are other plants in the genus Allium that also have the common name of onion, such as the Welsh onion (A. fistulosum), but when used without qualifiers, onion usually refers to Allium cepa. It is also known as the garden onion. Onions offer a unique (pungent) flavor and odor that makes them prized for a multitude of dishes. Furthermore, human creativity has improved upon the species by making a wide number of cultivars with different, desirable attributes. The expression "layers of the onion" is used to describe a situation in which it is possible to go deeper and deeper revealing seemingly similar layers until a central core is reached. It has been used as a metaphor in mysticism to describe the supposed layers of reality. Onions are variously placed in the flowering plant family Alliaceae or Liliales. Alliaceae, a family of herbaceous plants, are monocots and part of order Asparagales. The family has been widely but not universally recognized; in the past, the plants involved were often treated as belonging to the family Liliaceae, and still are by some botanists. The Liliaceae, or the lily family, is a family of monocots in the order Liliales. Plants in this family have linear leaves, mostly with parallel veins, and flower parts in threes. The lily family traditionally was a paraphyletic "catch-all" group that included a great number of genera that are now included in other families, such as those now placed in Alliaceae. The onion, Allium cepa, is known only in cultivation; it is no longer found in the wild. However, related wild species occur in Central Asia. The most closely-related species include Allium vavilovii Popov & Vved. and Allium asarense R.M. Fritsch & Matin from Iran (Grubben and Denton 2004). However Zohary and Hopf (2000) warn that "there are doubts whether the vavilovii collections tested represent genuine wild material or only feral derivatives of the crop." Allim cepa is believed to be of Asiatic origin. It is a hardy garden vegetable. The underground leaf bases, used in food storage, swell and form a tightly packed, concentric, fleshy bulb. As the bulb develops, the outer leaf base dries and becomes scaly, while the inner leaf bases thicken (UGA 2007). The bulb is rich in carbohydrates and a sulfur-rich volatile oil. Onions are grown mainly for this edible bulb, which has a pungent odor and taste, but the above-ground leaves also are eaten. Bolting (flowering) is initiated when temperates fall below 50° F (UGA 2007). The flowers are a compound umbel, composed of small, greenish white flowers, that form on an elongated stem arising from the center of the bulb (UGA 2007). The onion root system is fibrous and shallow, spreading from 12 to 18 inches below the soil (UGA 2007). The onion is a perennial, but the cultivated forms often die after flowering in their second year (PFAF). Along with garlics (Allium sativum), chives (A. schoenoprasum), and leeks (A. porrum), shallots are a close relative of onions. Shallot, as the word is commonly used, actually refers to two different Allium species of plant. The French grey shallot or griselle, which has been considered to be the "true shallot" by many, is Allium oschaninii, a species that grows wild from Central to Southwest Asia. Other varieties of shallot include Allium cepa var. aggregatum or multiplier onions, which are considered by some as a variety of the onion, but which others list as the separate species A. ascalonicum. The onion is easily propagated, transported, and stored. 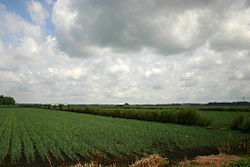 Onions may be grown from seed or, most commonly, from sets. Onion sets are produced by sowing seed very thickly one year, resulting in stunted plants that produce very small bulbs. These bulbs are very easy to set out and grow into mature bulbs the following year, but they have the reputation of producing a less durable bulb than onions grown directly from seed and thinned. Either planting method may be used to produce spring onions or green onions. 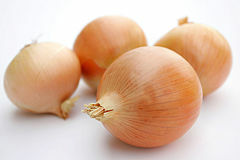 Bulb onions, grown from seeds or sets, range from the pungent varieties used for dried soups and onion powder to the mild and hearty sweet onions, such as the Vidalia from Georgia or Walla Walla from Washington, which can be sliced and eaten on a sandwich instead of meat. Multiplier onions are raised from bulbs that produce multiple shoots, each of which forms a bulb. 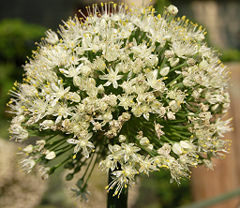 Tree onions or Egyptian onions produce bulblets in the flower head; a hybrid of Allium cepas. It is thought that bulbs from the onion family have been used as a food source for millennia. In Caananite Bronze Age settlements, traces of onion remains were found alongside fig and date stones dating back to 5000 B.C.E. However, it is not clear if these were cultivated onions. Archaeological and literary evidence suggests cultivation probably took place around two thousand years later in ancient Egypt, at the same time that leeks and garlic were cultivated. Workers who built the Egyptian pyramids may have been fed radishes and onions (SelfSufficientish 2007). Egyptians worshipped the onion, believing that its spherical shape and concentric rings symbolized eternal life. Onions were even used in Egyptian burials as evidenced by onion traces being found in the eye sockets of Ramesses IV. They believed that if buried with the dead, the strong scent of onions would bring breath back to the dead. In ancient Greece, athletes ate large quantities of onion because it was believed that it would lighten the balance of blood. Roman gladiators were rubbed down with onion to firm up their muscles. In the Middle Ages, onions were such an important food that people would pay for their rent with onions and even give them as gifts. Doctors were known to prescribe onions to relieve headaches, snakebite, and hair loss. Onions were also prescribed by doctors in the early 1500s to help with infertility in women, and even dogs and cattle and many other household pets. The onion was introduced to North America by Christopher Columbus on his 1492 expedition to Haiti. 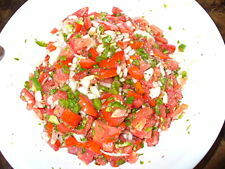 Onions are used in salsa. Today, onions are available in fresh, frozen, canned, pickled, and dehydrated forms. Onions can be used, usually chopped or sliced, in almost every type of food, including cooked foods and fresh salads, and as a spicy garnish. They are rarely eaten on their own but usually act as accompaniment to the main course. Depending on the variety, an onion can be sharp, spicy, and pungent or mild and sweet. Onions pickled in vinegar are eaten as a snack. These are often served as a side serving in fish and chip shops throughout the United Kingdom. Onions are a staple food in India, and are therefore fundamental to Indian cooking. They are commonly used as a base for curries, or made into a paste and eaten as a main course or as a side dish. Tissue from onions is frequently used in science education to demonstrate microscope usage, because they have particularly large cells which are readily observed even at low magnifications. While onions are not particularly high in most nutrients, they do contain anti-inflammatory, anti-cholesterol, anti-cancer, and antioxidant components, such as quercetin (GMF 2007). They also are rich in vitamin C and in chromium, a trace mineral tied to insulin response (GMF 2007). Onions, like garlic, is rich in sulfur-containing compounds that yield its pungent odor and taste and is responsible for many of its health effects (GMF 2007). Evidence suggests that onions may be effective against the common cold, heart disease, diabetes, osteoporosis, and other diseases. Onion consumption has been found to be inversely proportional to glucose levels in oral or intravenous glucose tolerance tests—which is suggested to trace to the allyl propyl disulfide in onions, which lowers blood sugar levels by increasing availability of free insulin (GMF 2007). Chromium is also considered to help cells respond appropriately to insulin, with clinical trials showing that chromium can improve glucose tolerance, lower insulin levels, decrease fasting blood glucose levels, and decrease total cholesterol levels (GMF 2007). Consumption of onions has been traced to lower high cholesterol levels and high blood pressure—likely due to chromium, sulfur compounds, and vitamin B6 (GMF 2007). Onions are a major source of flavonoids and phytochemicals, which are shown to have protective qualities against both cardiovascular disease and cancer (GMF 2007). Onions may be valuable for preventing excessive bone loss in women at increased risk for osteoporosis as they go through menopause, as it has a chemical that inhibits the activity of osteoclasts (the cells that break down bone) (GMF 2007). In many parts of the world, onions are used to heal blisters and boils. In homeopathy, Allium cepa is used for rhinorrhea and hay fever (Morrison 1993). Research suggests that quercetin, found in onions, reduces the size and number of precancerous lesions in the human intestinal tract (GMF 2007). As onions are sliced, cells are broken, allowing enzymes called alliinases to break down sulfides and generate sulfenic acids (amino acid sulfoxides). Sulphenic acids are unstable and decompose into a volatile gas called syn-propanethial-S-oxide. The gas diffuses through the air and eventually reaches the eye, where it reacts with the water to form a diluted solution of sulfuric acid. This acid irritates the nerve endings in the eye, making them sting. Tear glands produce tears to dilute and flush out the irritant (Scott 1999). Supplying ample water to the reaction prevents the gas from reaching the eyes. Eye irritation can, therefore, be avoided by cutting onions under running water or submerged in a basin of water. Rinsing the onion and leaving it wet while chopping may also be effective. Another way to avoid irritation is by not cutting off the root of the onion, or by doing it last, as the root of the onion has a higher concentration of enzymes (NOA). Chilling or freezing onions prevents the enzymes from activating, limiting the amount of gas generated. Using a sharp blade to chop onions will limit the cell damage and the release of enzymes that drive the irritation response. Having a fire, such as a candle or a burner, will help as the heat and flames will draw in the onion gas, burn it, and then send it up with the rest of the flame exhaust. In the heat, the chemical changes such that it no longer irritates the eyes. The volume of sulphenic acids released, and the irritation effect, differs among Allium species. Fay, M. F., and M. W. Chase. 1996. Resurrection of Themidaceae for the Brodiaea alliance, and recircumscription of Alliaceae, Amaryllidaceae and Agapanthoideae. Taxon 45: 441-451. George Mateljan Foundation (GMF). 2007. Onions. World's Healthiest Foods. Retrieved November 11, 2007. Grubben, G. J. H., and O. A. Denton. 2004. Plant Resources of Tropical Africa 2, Vegetables. PROTA Foundation. Leiden, NL: Backhuys. ISBN 9057821486. Morrison, R. 1993. Desktop guide to keynotes and confirmatory symptoms. Grass Valley, CA: Hahnemann Clinic Publishing. ISBN 096353680X. National Onion Association (NOA). n.d. About onions: Frequently asked questions. Onions-USA.org. Retrieved November 11, 2007. Plants For a Future (PFAF). n.d. Allium cepa. Plants For A Future. Retrieved May 13, 2008. Scott, T. 1999. What is the chemical process that causes my eyes to tear when I peel an onion? Scientific American October 1, 1999. Retrieved November 24, 2007. SelfSufficientish. 2007. Onions: Allium cepa. Selfsufficientish.com. Retrieved November 11, 2007. University of Georgia (UGA). 2007. Onion: Allium cepa. University of Georgia. Retrieved November 24, 2007. Zohary, D., and M. Hopf. 2000. Domestication of Plants in the Old World. Oxford, UK: Oxford University Press. ISBN 0198503571. All links retrieved December 20, 2018. This page was last modified on 20 December 2018, at 16:36.